It feels so strange to finally be sitting down and writing a blog post. I made it a personal goal for myself that I would try and get two posts out a week and I've been pretty successful. That is, until the boys and I went back home to Little Rock. I sat down one night to work on my blog at my Dad's house and low and behold, a man who owns his own business doesn't have WiFi at his own home!! As much as I was annoyed that first night it made for lots of jokes and jabs during the week at him. It actually worked out for the best, as it felt like a true vacation, and I was able to have some great quality time with my Dad after the boys went down. Well, not the first night, as Whitt, my super independent, I'll do what I want to do son got out of the bed and pack n play 9 times that first night!! Normally I don't get excited about trips until I've actually landed in my destination. However, before I even left for this trip I was excited. I was excited to see two of my best friends and their kids. But also get some "Tucker" time. I spend most of every day devoted to the boys, that I knew this trip I was going to do the things that I love to do. And the best part is my Mother loves to do the same things, shop and go to design stores. As much as I love Denver I've yet to find anyone who loves to go to design stores and appreciate every item in a shop as I do. It's just way more fun when you can talk about things with friends, or your Mother. Every Friday in the Donnelly household we have Pizza Friday. Because who wants to cook after a long week when you can order and 3 out of 4 will eat pizza. I'll give you one guess who doesn't like pizza. (hint: Mr. Independent) Then we skip baths and have movie night with popcorn and M&M's. I didn't have these traditions growing up because my parents divorced when I was 2.5 years old so it's important to me that the boys have a few to remember when they grow up. 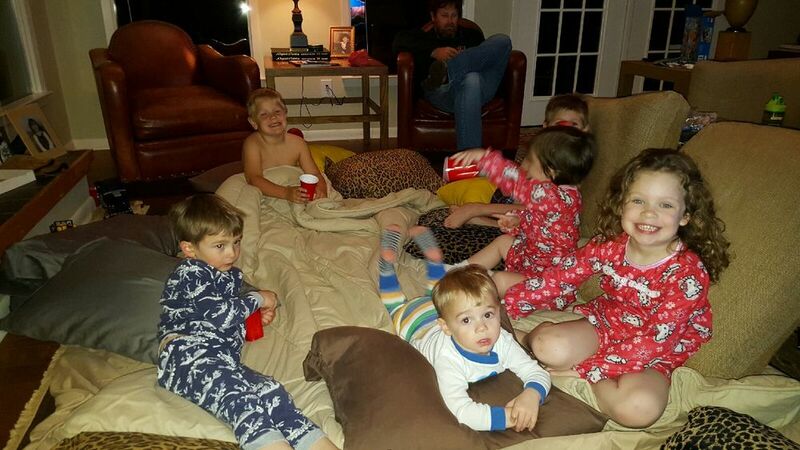 So we had two of my best friends with their families come over and had pizza and a movie and all 7 kids "watched" Finding Nemo. sweet baby joseph not even two weeks old. my sweet sweet asher loves him so. it melts your heart to see your son be so sweet to a baby.......baby fever like crazy over here!!! gourmet iced pops at Le Pops with Baba.....very excited they are opening a shop in boulder soon!! There aren't many places where you get praised for letting your children play in the mud fully dressed. Of course my boys were the only children to find the mud at the Little Rock rugby match . So boys will be boys, and you let them play then strip them down to play half naked. You see my Mother and Dad are polar opposites. They were destined for divorce. But as my Dad likes to say as a Dad would, " we got married so we could have you". Sure, nine years later, but that's another story. I got several comments about how people couldn't believe I was Sonya Hamilton's daughter. Because there would be no way Sonya would let her children play in the mud fully dressed in nice clothes! But, the boys had a blast and couldn't believe their "Baba" was able to touch judge at 67 years old! Ever since I was little during Spring Break my dad would take me to Oaklawn and he would place my $2.00 bet on a horse each race. You see, it's always been a win win for me. He pays for the bets and whatever I win, I keep. Whatever I loose, well, it's his money, so I guess I never technically lost. Of course he's passed this tradition on whenever we come back. But this year, now that Asher is older, he was WAY into it!!! He had a slow slow start but he won back to back races and by golly, that kid walked out with $66.00 that day!!! And Whitt won $6.40 but Baba gave him a $20.00 to feel better. And me, well I didn't win a damn thing!!!! And he didn't give me a $20.00!!! Side note, if you ever go to Oaklawn you have to order a reuben sandwich (it's what they're known for) and a Bloody Mary. I'm just sayin', there's a chance asher might become a bookie when he grows up. he was even approaching people he didn't know asking who they were betting on. My dad took the boys to The Wonder Place so my Mother and I could go "grown up" shopping. It's only taken almost 5 years and I think he can finally buckle my kids in their carseats! Side note: my younger cousin (who doesn't have kids) who used to live with my Dad told me that once he took the boys to dinner, got them out of their carseats but couldn't figure out how to put them back in their 5 point harness. (anyone with kids knows this is completely fool proof, rather, anyone could probably figure this out) so he called him to help him figure out how to put them back in their car seats. Gotta love it. could he be any cuter?!! So while the boys were playing my Mother and I were shopping!!! I've included list of my Little Rock finds! sorry for the tiny picture! this blouse looks like nothing special on the hanger, but looks smashing on! and it's on sale!!! I got this in black because I'm tired of wearing my North FAce fleece everyday. and it's on sale!!! Enough already right?! Here are some shots of some stores my Mother and I visited. If you ever visit Little Rock and need suggestions of where to go or what to do, don't hesitate to ask! Cobblestone and vine The front room of the Height's Cobblestone and vine is always my favorite. How could it not with that chandelier?!! Not photographed but worth the trip is Trianon Antiques and Phoenix Interiors if you're ever in Little Rock.